There aren’t many combos too. I managed to do some if there were more than 4 fruit at a time, moreover only if they were in a row and close to each other. Now that’s kind of depressing. There’s no special secrets when it comes to fruit cutting, as the approach is the same as the one in my game – replacement with the cut model. Each fruit can be cut only once, however it would be great if there was an opportunity to do that once more. 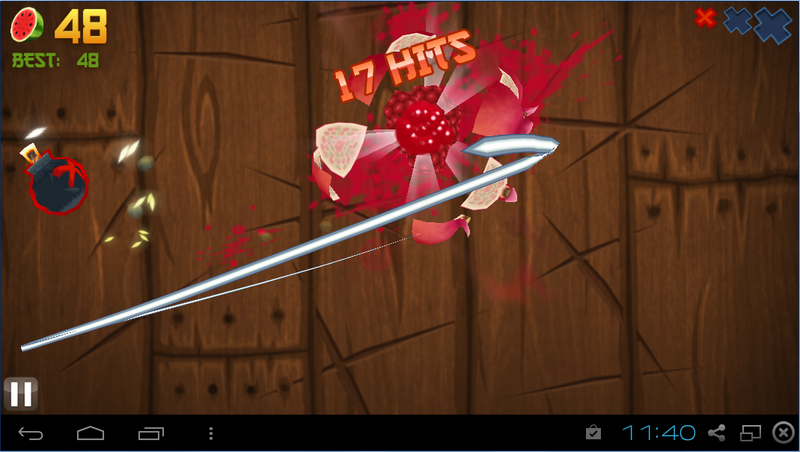 What I really like about this game, is when a pomegranate flies out and you need to cut it as many times you can. It’s cool: all actions are in slow motion + specific sound + you want to zap it as much as possible, all in all – that was well done. A lot of fruit appear from sides. I can’t say that there’s no variety, but it would be great if there were more features, which would appear with time – the standard scheme. 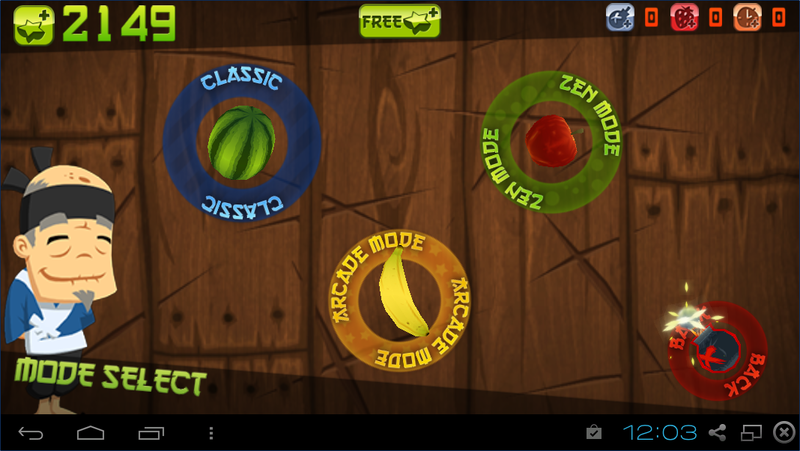 Zen mode is when all you need to do is slice as many fruit you can without paying any attention to the bombs. 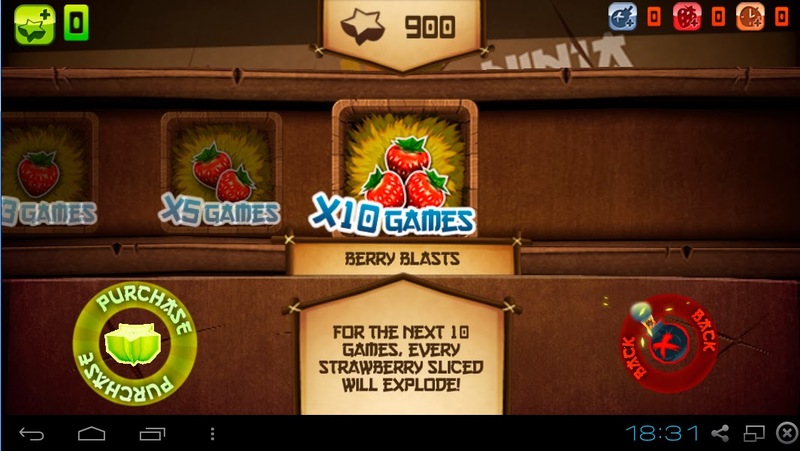 I played in it with a group mate during classes and all this mode is about is hysterically following the fruit on the screen with your finger without missing any of them – that’s quite all) cool, it builds arm muscles. 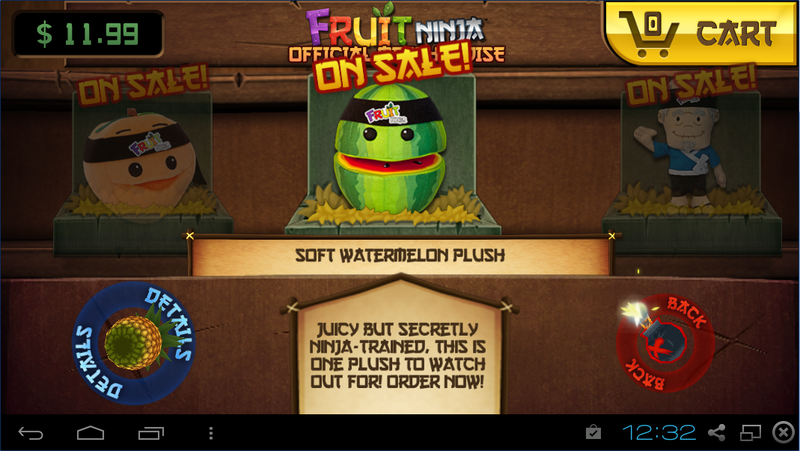 There’s also a store in the game – you can buy there real toys with real money. 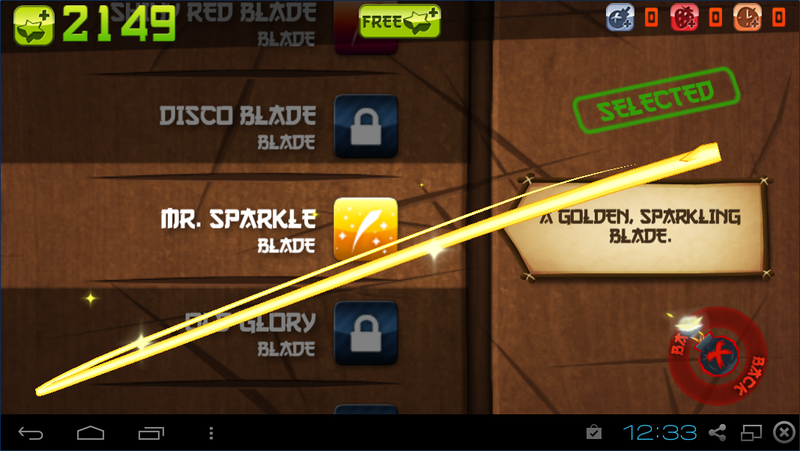 You can change the look of the blade for free. What’s most important – you can buy: a three time bomb protection, a three time strawberry appearance, which gives 5 points instead of one like other fruit, and peach, which gives you a time bonus (+ 5 seconds) after being cut. 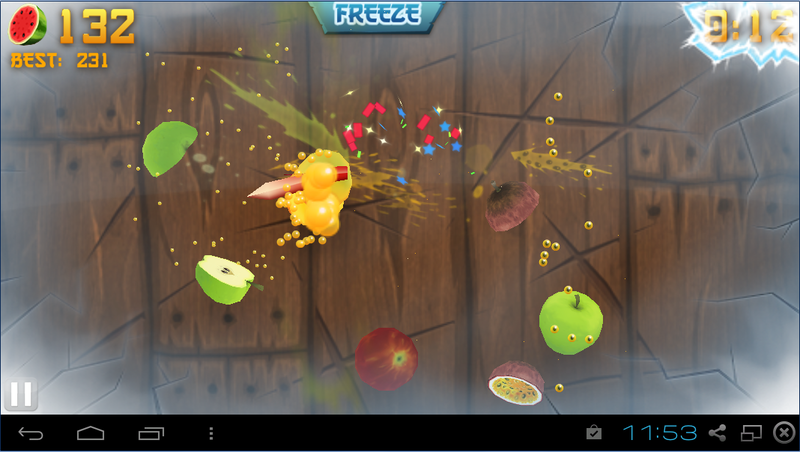 Sometimes the bomb physically interacts with some fruit and bounce off after touching them. It’s sad that in case of an abrupt movement the slicing of the fruit doesn’t always work. 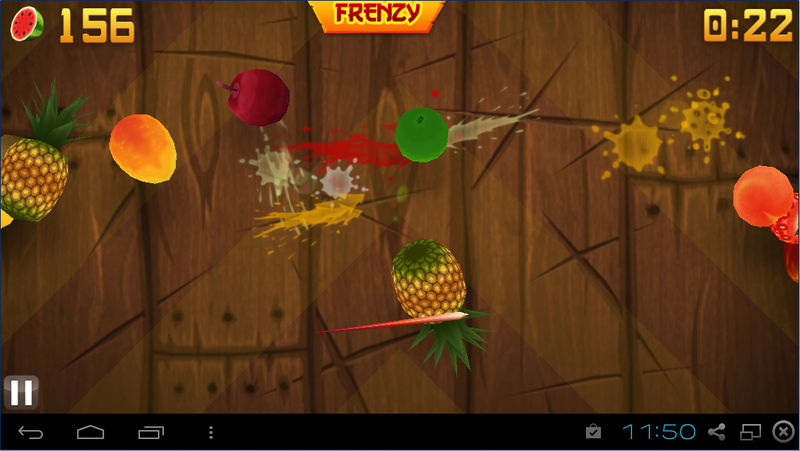 Unlike IPod, in the Android version there’s no multiplayer. 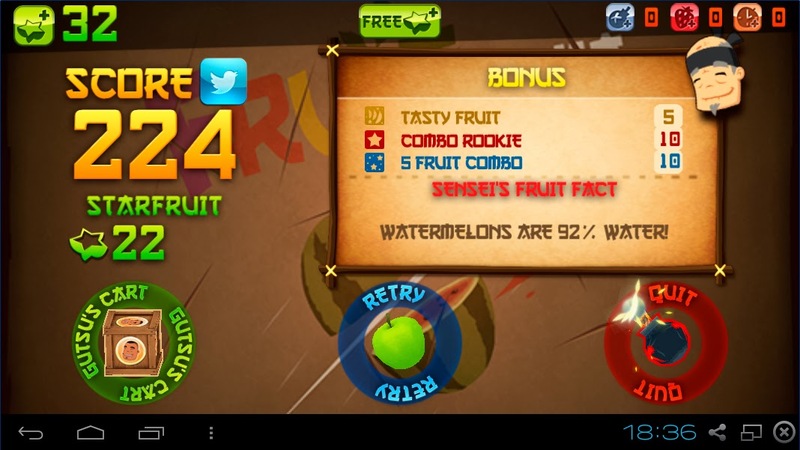 I played in the train once: the screen splits in two and the point is to strike more fruit on your half. ++ Forgotten about Achievements, can be found here and Premium Elements: You can purchase Stars for the real money and use them to get perks. 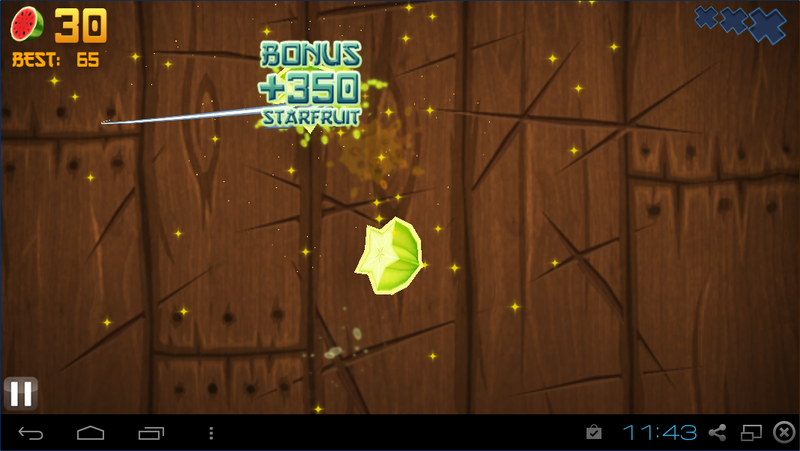 Starfuit is used as money in the game. You can use them for buying things from Gutsu’s Cart, which allows simplifying the game, getting more points as well as additional blades and backgrounds, which is more esthetic than functional and doesn’t actually affect the game. 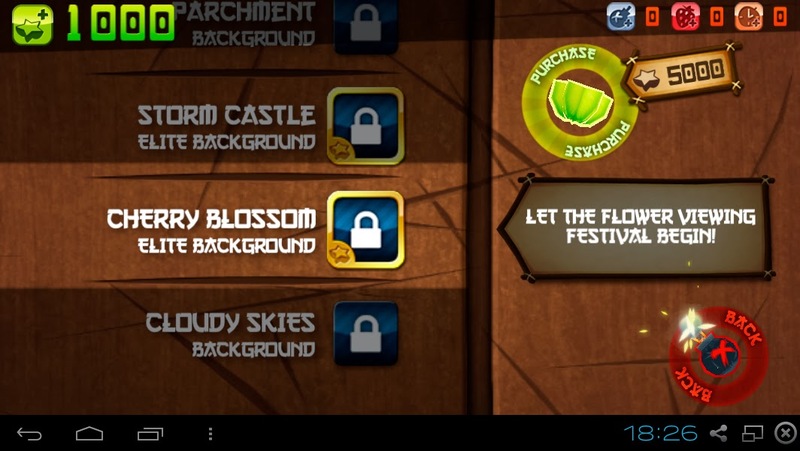 By the way, some backgrounds can be unblocked only for real money. As for the things, that are supposed to make the game easier (bomb protection, strawberry and peach), they can be bought in the amount of 3, 6 and 9 for the bombs and 3, 5, 10 for the strawberry and peach. Of course, they run out during the game quite fast and you need to go to the store again. The element in the store are available and don’t need to be unblocked with real money first. They can be bought with the starfruit you’ve earned. The game process is built in such way, that after 2-3 or, on rare occasions, you can afford a purchase after one game. 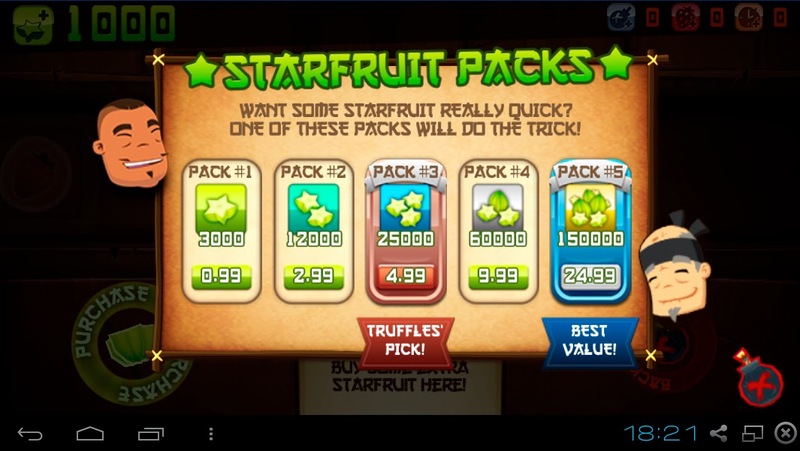 For those, who don’t want to waste time earning game money, there is a possibility to turn real money into stairfruit. The cheapest pack costs $0.99 and the most expensive - $24.99 (kind of too much  ). A dollar will be enough to buy the most expensive element in the store for three times (900 stairfruit) and if you play good, you can earn enough points for the 4 time too. If earning stairfruit on your own, one game brought me about 20-60, therefore for buying the cheapest element in the store (300 stairfruit) you’ll need approximately 3-5 games. 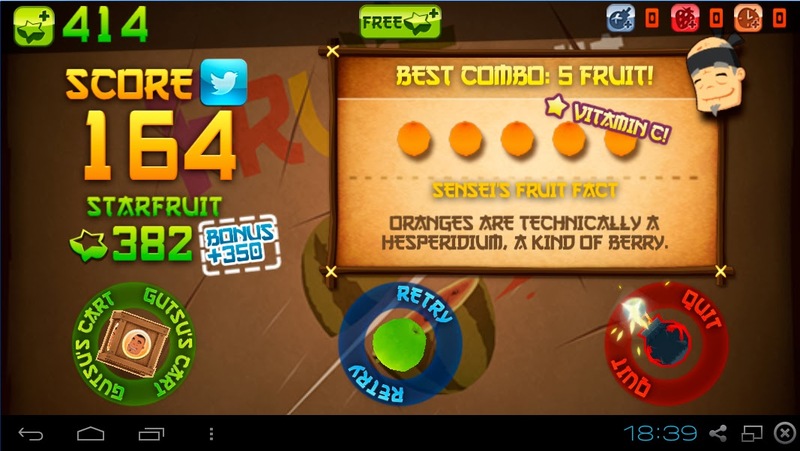 Sometimes I managed to slice a bonus rare fruit, which gives you 350 ninja dollars at once. 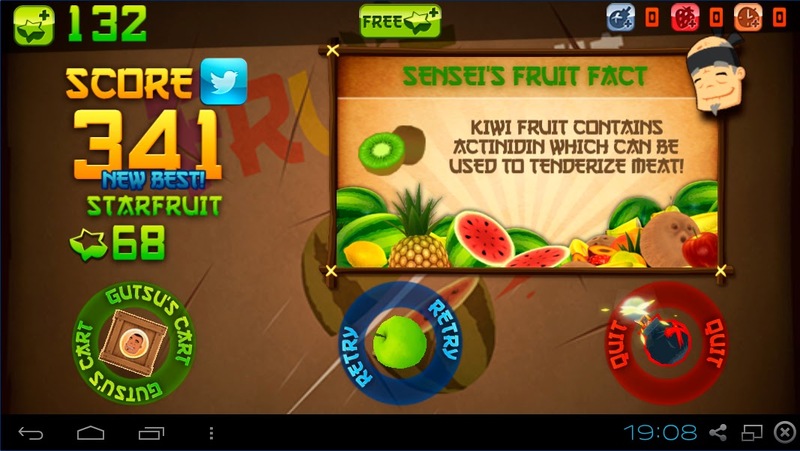 Stairfruit depend from the amount of the sliced fruit during the game, moreover, depending from the game mode you can get a ninja dollar for a different amount of the sliced fruit.